Verna Patrick, born with a veil, twelve years before the 20th century, was my Great Aunt. My Mother named me after her, and I spent many hours at her knee, listening to the stories of her youth. She worked in the mills, first as a dinner toter, and then later as a worker. She was a freckled red head with a Gibson Girl hair style. She married Robert Bell, but soon divorced him and married Dock Lipsey, with Papa’s blessings. Verna Patrick Lipsey never bore children. She knew what she had missed, often saying, “When they are small they step on your toes, when they grow up they step on your heart.” She loved having children near; she collected and created whimsical objects for their entertainment. Small wooden monkeys made from walnut shells, boxes of ribbons and buttons, for hours of play. She painted clay pots with bright colored faces, her porch always looked like Halloween with the toothful grins of red and black. These lined the steps that led into the rose garden, where the borders of pink periwinkles along the walk led to the garage and two large pecan trees. The trees were painted white half way up the trunk, for some supposedly useful reason. In the rear a vegetable garden held seasonal crops, fed with the castings from her husband Dock’s, rich, black worm beds, nestled in the shadow of a concrete block building. In the fall, the pecans were continually harvested, shelled and put in the freezer. Along with raisins, they were used in biscuit pudding, a staple always made in a small black iron skillet. Most days a plate with cold bacon and biscuits could be found on the stove. Lunch was Dinner, the only other meal of the day. Usually “boiled vittles”, served with fresh hot peppers from the garden and corn bread. An aluminum pan held a fruit cobbler, made with in-season fruit. A glass of ice water completed the meal. She couldn’t read, but the intuitive gift of the veil served her well. 10th Avenue Grocery was how they made their living. They lived in rooms behind the store; a large sliding metal door protected them at night when they rested, after working all day, six days a week. She ran the cash register and entered the charges in a large book. She had her own way of bookkeeping, in spite of not being able to read. There were many entries as the neighborhood was poor. They charged “checks” to the accounts and customers would use them to purchase goods. Days grew quiet, they were old now and were safe and comfortable with their small investments and Social Security checks arriving monthly. Not being greedy, they shared with family and friends, especially with my brother and me. I think they felt sorry for us, our parents were flighty and not given to practical matters. She still had the veil. It was wrapped in brown paper and tucked into the bottom corner of a bedside chest Dock made for her in his cabinet shop. She said whatever happens to the veil is what would be her fate. It was now a thin dried tissue, much like the thin fragile skin that covered her frail bones. Her last days were lost in the memories of her childhood. She called me Laura, one of her sisters. I was not there when she died, that is another story that will be much harder to write. But, Verna Patrick Lipsey gave my childhood a safe and comfortable refuge in times of storm and confusion. Verna Patrick was born in 1888. 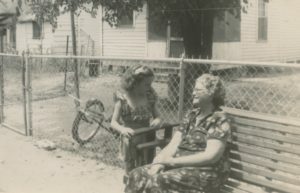 She was my Great Aunt, sister of J. R. Patrick, my Grandfather. I spent many hours with her, listening to her life stories. She loved talking about Momma and Poppa, Laura Langford and Alfred Patrick. Laura lived on Saint Mary’s Road and Alfred on Buena Vista Road. Both of their Fathers were farmers, living a very hard life, trying to provide for their families. Alfred fell in love with Laura and asked her to marry him. Laura consented with the agreement that they would live in Columbus and not be farmers. She wanted nothing to do with farm life. He agreed and they married. They started a family and built a house in Linwood, at the time it was a well-to-do neighborhood in Columbus. 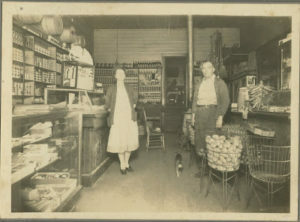 Alfred and his brother opened the Patrick and Brother Butcher Shop at the City Market in downtown Columbus. They had twelve children, who found jobs from an early age in the textile mills. Verna was a “Dinner Toter,” taking lunches to the workers. Laura did not want to be buried in Patrick Cemetery or the Providence Baptist Church Cemetery with her family. They purchased a lot in Linwood Cemetery where she knew there would be perpetual care. Even in death she still did not want to be in the country. Aunt Thelma gave me Aunt Verna’s chest, filled with photos. I have cared for them and now feel obligated and honored to tell her story.